Is it just me or is he not giving these quests this year? I just got mine from Belbi Quikswitch, the token redeemer, for 45 silver. also i wanted to note that i never got around to doing either of his quest last year so it must just not be available... anyone have any dissenting opinions? (6/23/09) confirmed that he no longer has any quests available. They have been removed from the game. Of course they can always add more quests later if they choose. As of patch 3.1 still no quests mentioned anywhere for him though. Goldark gives the quest for the Wolpertinger's Tankard for Brewfest 2009. You have to run around and catch 5 Wild Wolpertingers. Seems to be bugged for EU servers: he gives neither the Wolpertinger, nor the Elekk quest. 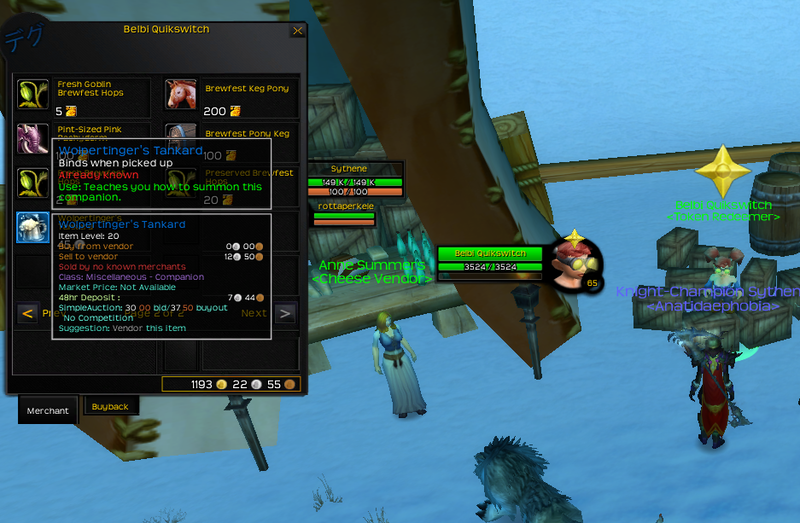 On EU servers, the Wolpertinger Tankard is still obtainable by buying it for 50 silver at the token redemmer though. He and his Horde counterpart have nearly the same name... just slightly different placement of letters =P. So no, It isn't a bug, it was intended by Blizzard not to work...or they just didn't bother to fix it for the EU folks. - Catch the Wild Wolpertinger! EDIT: My bad, Belbi sells the pet. On European realms at least. His name, Snipehunter, is a reference to Snipe Hunts, a practical joke consisting of a hunt/search for a creature/object that does not exist. Which fits with him sending us after wolpertingers and pink elekks, creatures that may not actually exist as they're only visible when drunk. Not sure if quest exists anymore at this patch, but yea. The horde version of Goldark Snipehunter is Glodrak Huntsniper. I found this amusing. On EU servers, only the goggles can be obtained from him. He is standing near the entrance of the area.